The most wonderful time of the year can bring out the puppy in our dogs, regardless of their age. Frosty air puts dogs in a frisky mood and can lead to some fun adventures close to home or on the road. No one knows your dog better than you, and this is a good time of year to bring you and your four legged family member closer together. Our furry friends love a romp in the snow or on a wind-swept beach. Encourage your dog’s investigative powers by hiding a toy a few inches into a snow drift or sand pile and allow him to dive in after it. Urban areas offer parks which are now largely given over to cold-loving canines. Use a long line for safety and practice your ‘Come’ command, or play a tracking game by lightly dragging one of the dog’s favorite toys over the snow and then stashing it under a bush. Tell your dog, “Find it!” and help guide his powerful nose to the prize. Pick up a fallen tree branch, drag it in front of your dog and watch his chase and pounce instincts kick in. Your dog will often communicate directly with you to invite play. Look for a big grin atop wide-set front paws, or elbows down and rear end in the air. Barking right at you can be a play invitation, too. In fact, dog owners are very good at picking up on their dog’s moods and emotions. British researchers found that dog owners could discern different tones of barks and what emotional state the dog was in just by listening to vocalizing on headphones, even with dogs they had never seen or heard before. All dogs descend from wolves, even if the resemblance has missed your pug or spaniel. Winter can bring out the wolf in your dog, showing off some of the old wild instincts. Behaviors that we may find annoying can be quite satisfying to the dog: digging, pawing, vocalizing with barks, whines, and growls, long sniffing sessions at one tree or post, and even urine marking. Give your Pomeranian or poodle the chance to howl at the moon instead of discouraging these natural behaviors. In the wild, wolves are challenged in winter to go farther to find good hunting areas and need to vocalize to communicate with each other. Before the hunt, wolves will gather together, tilt their noses up and bark, yip and howl. This is called ‘cheerleading’ and is thought to be a supportive and motivating factor for the hunting party. When wolves return from the hunt, the pack greets them with joyful barks and playful postures. This is precisely why your dog prances happily when you arrive home, especially if you are armed with the spoils of the hunt: grocery bags! Your older dog may feel a bit creaky after a romp, and will look for a comfy place to rest at home. Take a good look at his dog bed. Squashed or springy? Fluffy or flat? Check the filling. Too soft means his elbows get all the way down to the floor. Does he paw at it repeatedly, or just look balefully at you when he stands on it? A worn-out bed won’t help your dog recharge his batteries. Cold climate dwellers can opt for self-warming beds that reflect the dog’s body heat, or even go with memory foam for extra support. Dogs with very short hair that like to sleep curled up will prefer a curved or corner bed with back support. If your lucky dog claims sofa space, consider his joints when he jumps up and down off your couch. Richell USA offers 3-Step Stool V1. These steps are designer-quality with a sleek profile that blends with any décor. They are lightweight but sturdy and have slip resistant treads and rubber feet to protect tile and wood floors. Three steps are safer than two and allow your dog to climb up easily. Complete the look with the matching Doggy Dining Tray V1 which elevates feeding your dog at a healthy level up off the floor and stores food or toys within. ‘Tis the season for gift-giving, so why not pick up something nice for your pooch? If you are thinking of stuffing a stocking for your pet, you are not alone. A new AP-Petside.com poll finds over half of all pet owners in the US will buy something for their tail-wagging family members and will spend an average of $46.00, with toys and treats topping the list. An outing to the local pet supply store can be a great way to socialize your dog and let him pick out his own toy or bone. If all your dog really needs is love this season, consider buying a gift for a needy shelter pet. A new toy, bone or bed will comfort a dog or cat waiting for a home. Many shelters have their own retail stores, and buying from them is a double donation. Thousands of new puppies and adopted dogs will find new homes this season. 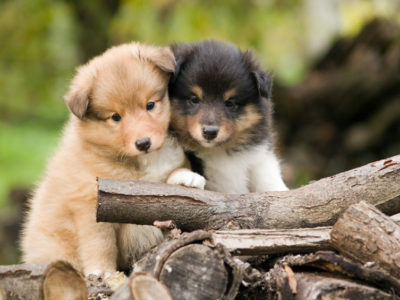 It is tempting to give a puppy to a loved one as a gift, but this can turn into a minefield of problems. Once the holidays are over and the puppy’s ‘newness’ wears off, your stressed-out recipient may resent the extra chores, expense, and commitment required to raise a puppy. Get that feel-good lift that comes with gift-giving and surprise your recipient with a more appropriate bundle: gifts that will provide function and beauty from Richell USA. Check out my pick for new pups: the Expandable Pet Crate. It expands as the puppy grows and can be divided for two pets to occupy. Outfit this gorgeous and versatile piece with super absorbent PAW TRAX Doggie Pads and a PAW TRAX Mesh Training Tray for easy, indoor housetraining. Add a couple of bowls, a toy, and training books or videos to provide a thoughtful and practical nudge toward dog ownership. Cold, wet noses and holiday decorations simply don’t mix. Plants like holly, mistletoe and poinsettia are all toxic to dogs and cats. (http://www.petmd.com/dog/seasonal/evr_multi_dangerous_winter_holiday) Tree ornaments and tinsel have sharp edges that can damage pets’ mouths and digestive systems. Not all hazards are ingested. Invitations to friends and family mean ringing doorbells and hello hugs, a perfect opportunity for a door-dashing dog to slip out. 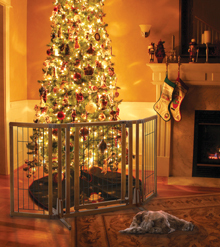 Richell USA, Premium Plus Pet Gate. These gates expand to fit doorway and hallway openings from 34” to 63” wide. Plus, the specially designed walk-thru door opens in both directions and includes an upper/lower locking system to allow free movement and extra security! Contact Richell USA today to order the perfect gate for your pup! Whether you like nesting at home or tackling new adventures this season, your dog’s single ambition is to stay close to you. New Year’s resolutions are easy to make but tough to keep, but a promise to spend more time with your pup will earn you an enthusiastic ‘Two Paws Up!’ from your best friend.